Typhoon Usagi continues to gather strength in the West Pacific as it continues on a course for southern Japan. On August 1 at 1200 Zulu Time (9:00 p.m. Japan Local Time), Usagi was located near 27.5 north and 134.8 east or approximately 385 miles east-northeast of Naha, Okinawa, Japan. Usagi was moving northwest at 14 knots (16 mph). Maximum sustained winds were 115 knots (132 mph) with gusts to 140 knots (161 mph). It is expected to continue tracking northwest and make landfall over Kyushu mid-day on August 2. 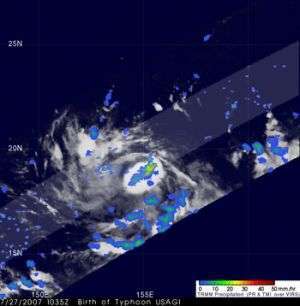 This image from TRMM was taken at 10:35 Universal Time on July 27, about 24 hours before the system became a tropical depression. The image shows the horizontal distribution of rain intensity looking down on the storm. Rain rates in the center of the swath are from the TRMM Precipitation Radar (PR), while those in the outer portion are from the TRMM Microwave Imager (TMI). The rain rates are overlaid on infrared (IR) data from the TRMM Visible Infrared Scanner (VIRS). At this stage, the system appears as a relatively small cluster of storms. The circulation is very weak with no evidence of banding (curvature) in the rain field.